The program notes for Gallim Dance’s “Sit, Kneel, Stand,” reference a quote from Camus: “One must imagine Sisyphus happy.” Andrea Miller, Gallim’s founder and choreographer, addressed Camus’s challenge by imagining the interminable Sisyphean task as that of the choreographer, to hilarious effect. As the audience filtered in, Troy Ogilvie writhed, blank-faced, through a series of disjointed movements along the front of the stage, hopping up onto the stage as the curtain rose. The six dancers she joined were dressed in shorts or skirts and boxy, cropped tops, which hung about their bodies. In the upper left corner of the stage was a sculpture-like pile of white folding chairs. The piece quite literally announced its comic intention, as Francesa Romo strode onto the stage making exaggerated presentation-like movements and yelled, in a high-pitched voice: “This is how we gonna start!” After her exit, a section of straightforward dancing to the sounds of birds tweeting provided a stark contrast to the overblown physical comedy, a pattern that would recur throughout. That pile of chairs took on life as Jonathan Royse Windham began to fret, in sometimes-audible mumblings, about Arika Yamada and the chairs upon which she was dancing. His body seemed hardly under his control, as he found himself in extreme positions after trying to execute simple movements or struggling to control his leg after it flew up at an extreme angle. When he managed, after much struggle and muttering, to shift a chair, allowing Yamada to continue her dance uninterrupted, Windham broke into ecstatic celebration: think of a gymnast sticking-the-landing. Much to his relief, after Yamada was carried off by Ogilvie, Windham joined Mario Bermudez Gil and Dan Walczak, and attempted to keep up with their complex choreography. His exaggerated awkwardness foregrounded the way in which the movement in the piece often seemed to originate externally. It were as if the dancers were removed from their bodies, exploring, observing, and occasionally attempting to control what happened there. At times, Romo herself was the one dancing, using her dancer or his limbs, as little more than a prop. The adjustments she made to Gil echoed the way that the dancers adjusted or manipulated each other throughout the piece: sometimes mechanically, sometimes tenderly. What is the choreographer’s role in relation to the movement that continues outside of, and impervious to, her efforts? How does one end a piece about interminability? Miller answered this conundrum with a playful, shrieking game of tag. Tag of course, has no definite end—it always begins again when a new player is deemed “it”—and yet this detracts not at all from the pleasure involved. The dancers’ game of tag also returned to the idea of the transfer of movement from one body to another, which had been so central to the piece. Here, perhaps, was a suggestion of how Sisyphus might be happy. 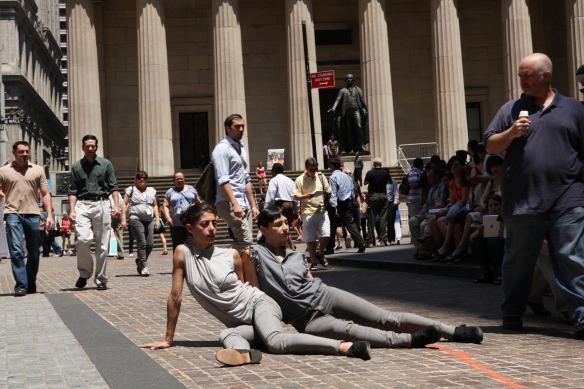 The River to River Festival does not simply transpose the experience of seeing dance in a theatre to an outdoor venue, but asks choreographers to imagine, or re-imagine, their works in a delightful variety of unlikely spaces around Lower Manhattan. 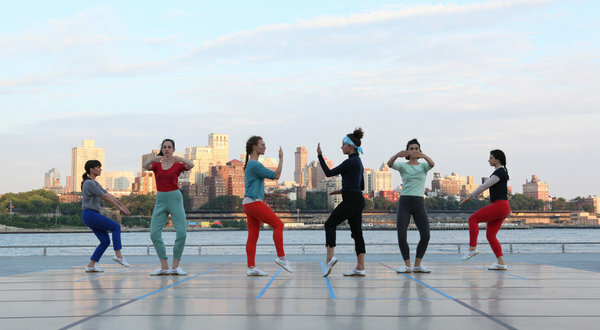 Placing dance in these contexts brings the works into direct contact with the city: offhand comments from unwitting passersby, the sounds of traffic, and commentary from a tour guide on a Circle Line cruise are not simply distractions, but part of the performance. I got off the subway at Wall Street on a sunny Thursday afternoon, looking around for evidence of where Maria Hassabi’s “SHOW” might be happening. The streets and sidewalks were filled with the crush of workers and tourists that is the Financial District, and then suddenly, two women, their gazes locked, sunk down to the sidewalk in a low, intertwined crouch. These slight performers, dwarfed by the buildings around them, seemed to draw in and focus the dispersed energy of the street as their performance materialized. Hassabi and Hristoula Harakas were clad in skinny gray jeans and gray sleeveless tops, accentuating the grayness of the space around them: cobblestone, concrete, and somber buildings. With painstaking control, they moved in and out of positions—standing, lying down, crouching—at a glacial pace, their taut, muscular limbs visibly engaged. The two remained in close, even tense, engagement with each other, never straying more than inches apart, even as their gazes eventually turned outwards. Staring out at the audience has become a contemporary dance cliché, but in this setting, it took on a stronger valence: there were potential audience members on all sides of the dancers, complicating the power dynamic between performer and audience. The audience was not a single entity that could be directly addressed. The backdrop made for a strange juxtaposition: this intimate, focused dance took place in front of the New York Stock Exchange, which was draped with a gigantic American flag. I couldn’t help but think of Occupy Wall Street (the imagery of which included, after all, a dancer atop Wall Street’s bull) as these dancers literally occupied this symbolic stretch of sidewalk. I overheard a bit of conversation between businessmen in which one asked another, “What’s the yield?” as he swerved to avoid the performers. There were a few people who sat and watched the piece in its entirety, but most stopped only for a few minutes, intrigued. There is real value in this casual availability of performance: it demands little of its audience, but tempts them with the promise of much more if they do choose to engage, however briefly. After a final standing pose, the two dancers turned and walked off down the street, as if merging into the flow of pedestrian traffic. They had emerged out of this hubbub, and concluded by returning to it. The yield? Impossible to quantify, but I left feeling stirred by this fleeting materialization of a performance within the gray chaos. While “SHOW” was very much of the streets, Beth Gill’s “Electric Midwife” took place on the very edge of Manhattan. Pier 15, jutting out into the Hudson River from the South Street Seaport, provides an incredible setting, with the Brooklyn Bridge and the Brooklyn Heights skyline as the backdrop. While this venue drew a more intentional audience than “SHOW”—a large crowd gathered before the performance—it also had its incidental observers: I heard a child playing on the level above ask “What is that?” and a Circle Line tour operator point out the “modern dance” to his passengers. 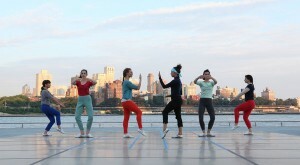 The six dancers, all women, entered in pairs, dressed in solid-colored layered pants and tops and white sneakers. Upon arrival, each pair assumed a different pose, forming a tableau. The only sound was the water all around us. Eventually, two of the dancers turned to each other and lifted their arms in unison, as if holding opposite ends of the same string. This initiated the symmetrical movement that would characterize the entire piece, the dancers mirroring their partners on the opposite side of the stage. Dancers mirroring one another is one of the most basic components of classical ballet choreography, and yet what a different valence it took on in this context! The neat grid the performers danced upon accentuated the geometric qualities of the structure. I’m not sure at what point I became aware of the score (by Jon Moniaci), but I suddenly realized that the low-frequency sounds were not the rumbling of airplanes overhead, but were coming from the speakers. As the score eventually intensified, so did the dancing, becoming quicker, bigger, taking up more space, and advancing all the way to the front of the “stage” for the first time. Swinging—of limbs and bodies in all directions—became the dominant motif. In the final section, the dancers began to move off the grid that formed their stage, as the score became more melodious and the choreography involved more contact between the dancers: a hand resting on a shoulder, a head leaning on a standing leg. Two of the dancers periodically ran to the side, leaning out over the water as they hit the pier’s railing—literally testing the boundaries of the performance space—and then calmly walked back to the center. With this expansion beyond the grid, there was also less focus on the creation lines and angles, as movements became more fluid. As dusk approached, the dancers left the stage, two-by-two as they had entered. They descended the steps toward the water and disappeared to a level below, leaving us looking at the bright moon over the Brooklyn horizon. The Paris Opera Ballet’s production of Giselle was the highlight of their first New York appearance in sixteen years, as part of the Lincoln Center Festival. The scenery for the first act (by Alexandre Benois of the Ballets Russes) looked like cut-outs from a richly-illustrated storybook. As the action began with the entrance of the village peasants, the strength of the corps de ballet was immediately evident–the choreography was characterized by ease and grace. Throughout the ranks of the company, I was enthralled by the women’s beautiful arches and the remarkable way they articulated their feet in each step and jump. Dorothée Gilbert, as Giselle, was technically stunning without being overtly showy. Her exquisite dancing added to, rather than distracted from, her portrayal of Giselle as a radiant, fun-loving young village woman. Albrecht, danced by Josua Hoffalt, did not have much dancing in the first act, but what we did see—long, elegant lines and jumps in which his legs beat with exquisite clarity—left me eager for his second act solos. As Giselle begins to realize that her supposed lover is in fact, nobility, and engaged to one of his own class, there are two instances which might be called “freeze frames.” As everyone on the stage remains frozen in their place, Giselle breaks off, conveying to us the progression of her so-called “madness.” These scenes make it clear that her consciousness is no longer operating on the same level as those around her. Time is slowing down for her, and she is having difficulty perceiving herself as part of world as others see it. After Giselle collapses into Albrecht’s arms at the close of the mad scene, the gravity of his actions dawn on him for the first time, as he looks around at a sea of unsympathetic faces. The second act opens with a group of men in the forest, soon scared away by the entrance of a few threatening wilis—spirits of women who died before their wedding day. As they forcefully announced their presence, furiously echoing the pantomimed motion for dancing from the first act, it is clear that these are no mere white wisps, but spirits to contend with. As the corps de ballet of wilis enters en masse, led by their queen Myrtha, their shared training at the Paris Opera Ballet School shines through in their perfect synchronicity and symmetry—each arabesque is the same height and shape as the one behind it. All of the women, from Gilbert through the corps, evoked the image of the Romantic ballerina to perfection: the slope of the shoulders, the forward lilt of the torso, and the demure position of the head. In their uniformity, they are at once ethereal and terrifying. Gilbert had a number of breathtaking moments in this act, from the way she carried her arms, to more virtuoso effects like lightning fast bourées and seemingly weightless jumps. Hoffalt was an impeccable partner, invisibly assisting Gilbert as she floated in and out of his arms. He was stoic during an impressive series of entrechat sixes (jumps in which the legs beat three times) and truly looked as if he were dancing for this life against exhaustion. In their variations and pas de deux, Gilbert and Hoffalt were so thrilling that the frequent applause was almost distracting, but the two never strayed from their intimate mood: she, resigned and yet determined to save him; he, desperate in his inability to hold on to the love he acknowledged too late.